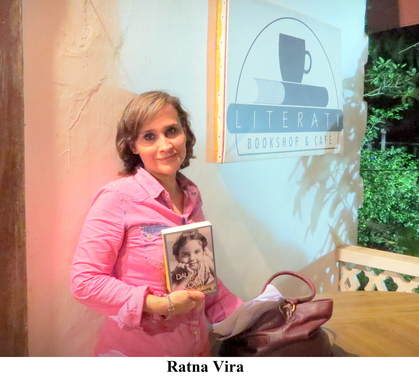 Social activism and speaking out for the voiceless runs prominently in her family, so it is not surprising that Ratna Vira would follow along those very same lines. The beginnings of the blueprint for her novel seem to have been drawn up in her childhood. Ratna Vira is the daughter of journalist Nalini Singh, who is best known for her programme Aankhon Dekhi; she is the niece of Arun Shourie, one of India’s most renowned journalists; and the granddaughter of Hari Dev Shourie, well-known for his consumer activism. Ergo, Daughter by Court Order, published by Fingerprint, is a novel that attacks the hypocritical idea of family izzat (honour) that runs rampant in our country, talks about mother-daughter relations and stresses on the question of identity. Ms. Vira describes herself as, ‘…a soft spoken and enigmatic woman with many facets. A contemporary woman who juggles a successful corporate career with her writing and love of art; weaves stories with her words and her paintings spill over with joyous colour.’ She has a master’s degree from the London School of Economics and Political Science, as well as a Master of Arts degree in English Literature from St.Stephen’s College, Delhi University and an MBA degree. She has worked in senior positions for the best corporates in India. 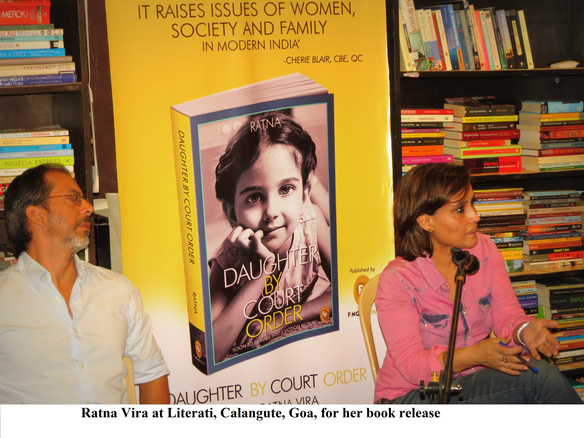 Daughter by Court Order gives us a modern Indian woman, a single mother in her thirties, Aranya, guided by the values and ideas dictated by that modernity, pitted against relatives holding on to a medieval mind set. This is, evidently, what transpires on a day to day basis in India. Most of us can relate to at least some of the issues, if not all, addressed in the book. The novel has the main protagonist, Aranya battling her own relatives in court in an attempt to establish her identity and stake her rightful claim to her grandfather’s property, under the Hindu Succession (Amendment) Act 2005. This Act allows joint ownership of property to sons and daughters. Aranya’s relatives and more importantly, her abusive and manipulative mother, conspire to divest her of her share of the property by denying her existence. The novel gives us insight into the zamindari system and its pitfalls. The façade of family honour, which cares not for the feelings and emotions of individuals, is exposed. For example, Aranya is told by her grandfather to stay in a marriage that she knows is not working anymore, for the sake of family honour. The violently abusive relationship between Aranya and her mother is explored as is the tendency of Indian parents to live their dreams through their children. Aranya breaks the cycle by giving her daughter the freedom to make her own choices. The novel also deals with gender issues as seen in the discriminatory behaviour towards her and her brother, as the male child is more esteemed in India. Against all given advice, Aranya adamantly proceeds with the court case and can be seen as a beacon for all Indian women who are ignorant of the laws they can avail of for economic and social rights, or are simply afraid to go to court without trepidation regarding repercussions. Though some of this fear may be justified, as Ms. Vira says, ‘What is frightening is the court adjournments, delaying justice.’ But women seeking justice should not let that hinder their fight. It was a long time before Ms. Vira set about fashioning a novel out of the ideas swirling in her head. Her flourishing corporate career held her back till she decided to make the transition to consultancy from full time work. She wishes she had been more disciplined in her writing. There were days when she would write prolifically and other days when she would suffer from writer’s block and would take time off to paint. Ms. Vira employs a non-sequential style of writing which entices the reader to enter into Aranya’s world. She has integrated letters, emails and songs into the narrative to engage the readers’ interest. She admits all this was done with a purpose because she finds the linear narrative style boring. The novel may be a work of fiction but the stories that have influenced its creation are real enough. Ms. Vira says, ‘While interning with WARLAW, Women’s Action Research and Legal Action for Women run by Rani Jethmalani, several years ago, I came across several cases of issues faced by women and realised that problems faced by women are not limited to any strata or class of society.’ There are other incidents that the author was privy to which also prodded her on to write the book. Aside from this, she was tremendously inspired by the activism of her grandfather, H.D. Shourie, who worked in the legal arena, dealing with concerns of the common man. It was not just the stories she came across but her grandfather’s conviction that the justice system was capable of working as it should, which he proved through his achievements.